GLOBAL - Zoonotic diseases continue to be a threat to global health, causing millions of deaths and economic losses every year. 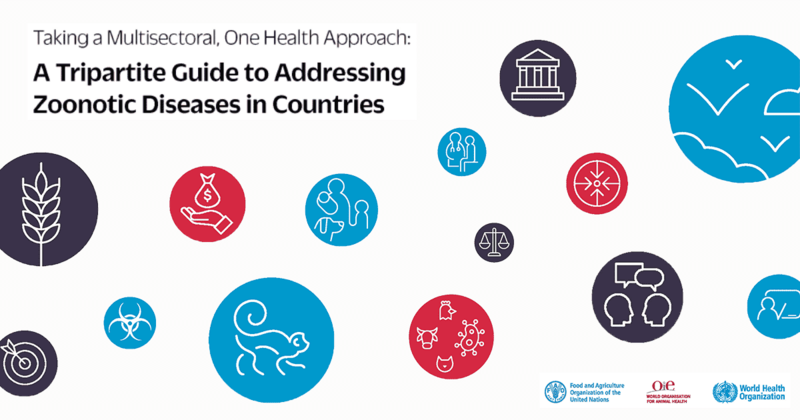 To support countries to control these diseases, the Tripartite organisations (FAO, OIE and WHO) today launched a guide entitled ‘Taking a Multisectoral, One Health Approach: A Tripartite Guide to Addressing Zoonotic Diseases in Countries’. Zoonotic diseases – those diseases that can spread between animals and people – continue to have major impacts on human health. Every year, nearly 60 000 people die from rabies, and other zoonotic diseases such as avian influenza, Ebola or Rift Valley fever constitute additional threats. These diseases do not only affect human health, but also animal health and welfare, causing lowered productivity (milk or egg quality and safety, etc. ), or death, and consequently affecting farmers’ livelihoods and countries’ economies. By working collaboratively across sectors and disciplines, human and animal lives are saved, livelihoods are secured, and our global health systems are improved in a sustainable way. The Tripartite organisations encourage countries to use the TZG to achieve these goals by taking a One Health approach to address zoonotic diseases.